Enter the Win All Week Mario vs Sonic Sweepstakes for your chance to Win a Super Mario Themed Prize Pack or a Sonic the Hedgehog Themed Prize Pack! 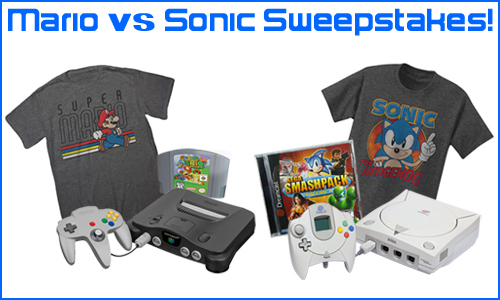 The winner gets to choose from a Mario Prize Pack containing a Super Mario T-Shirt, Nintendo 64 Console & Controller with Mario 64, or a Sonic the Hedgehog T-Shirt, Sega Dreamcast Console & Controller and Sega Smash Pack Volume I featuring 12 classic Sega Genesis Games. Hurry, this sweepstakes ends on May 25th, 2016! This Sweepstakes ends on 05/26/16 and you can ENTER ONCE to win.